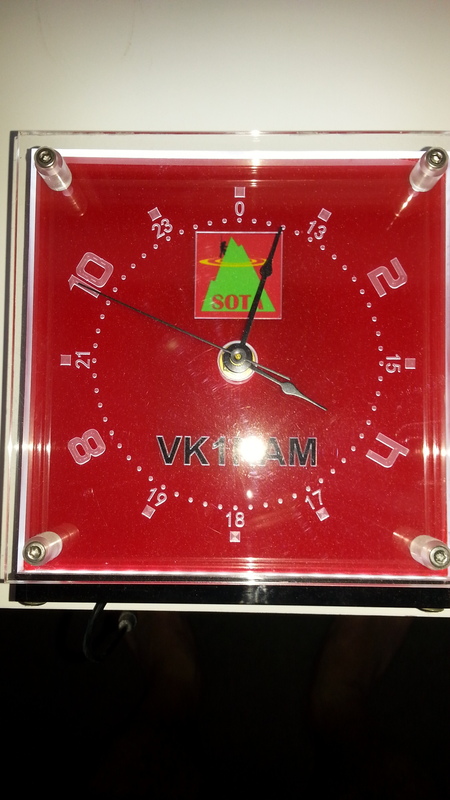 As well suggested by Colin M1BUU, I will start a new thread to speak and show our SOTA Watches. It might be an interesting topic for a cold, windy and rainy/snowy weekend with no possibility to carry out any SOTA activation. At least over here, near to the Pyrenees. down a hill by accident. 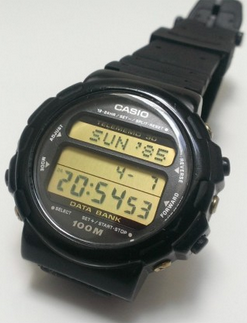 Personally I use an old CASIO digital wrist watch which I only use on SOTA activations and it’s permanently set with UTC time. For some unknown reason I have the maniatic habit of looking at it and writing down the exact time while I’m logging each and every QSO I do, no matter the speed. 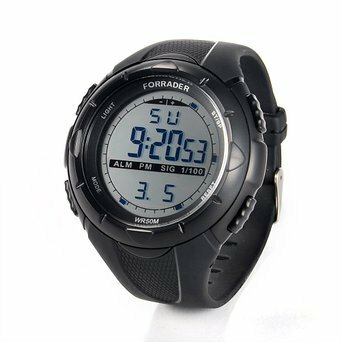 I wear it on my left wrist and I use my left hand to hold the Palm Radio minipaddle together with my log notebook, so the watch is almost in front of my eyes while I’m working on the paddles and writing callsigns on the log with my right hand. Adrian G4AZS is another wrist watch user but he hasn’t shown his yet. 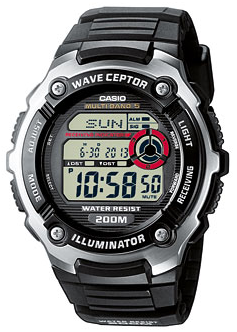 So far, it looks like the HB9 activators prefer clocks rather than wrist watches. I’d like to read about the reasons why you like using clock instead of wristwatch and I’d ask you to tell us whether you have ever had your clock blown off in a windy summit. Thanks to all who have contributed so far and thanks in advance to all future contributors. maybe I have some kind of Switzerland influence… I use to take a spare clock that my daughter is no longer using. It was formerly a wristwatch but its wristband was broken and she intended to put it in the bin. 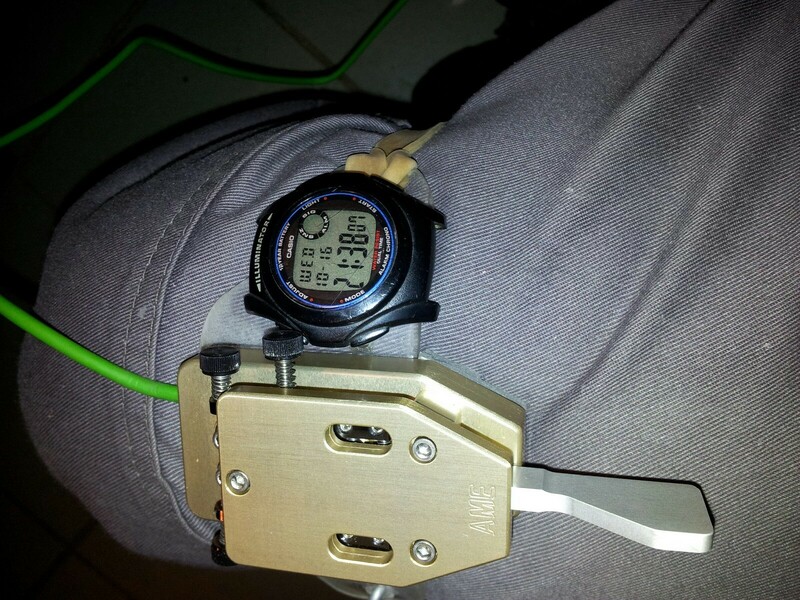 Instead I removed the band, settled to UTC (as you) and I put it next the logbook (I love recycling). Just in front of FT817 on a dbad weather day. Depending on the weather I lay it over the rucksack or in my wooden pad to hold the paper log. So far no problems with the wind, and if I loose it somewhen I think I won’t worry much. It does have a thermometer of sorts too. It has large numbers so I can see it! Watch-wise, I just have my ever so boring Timex explorer one. So far… I haven’t lost either… yet! Here’s mine. Nice and bright. Attaches with velcro, powered off the radio battery. 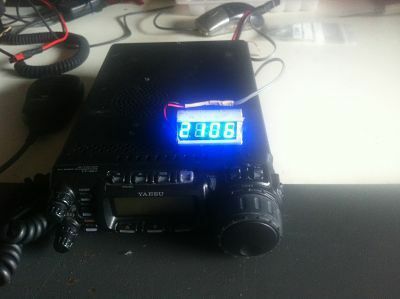 A permanently visible clock - well fixed to the setup! - allows an ergonomic work and is particularly useful when operating with gloves and/or jacket. 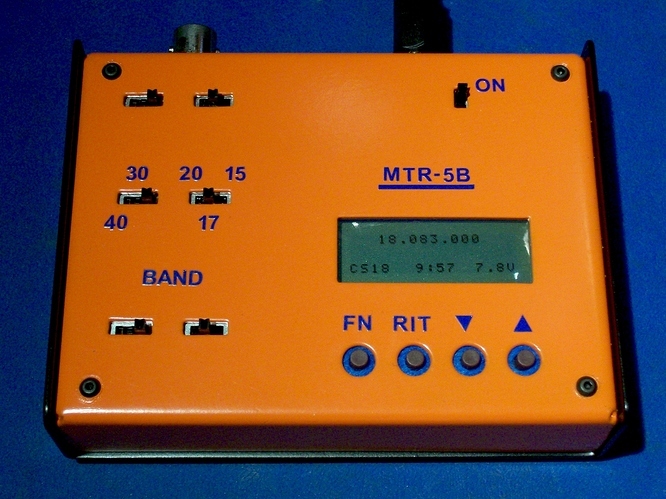 And, of course, it is also very useful when “looking at it and writing down the exact time while I’m logging each and every QSO I do, no matter the speed” Up to what speed in your case? I use this clock. 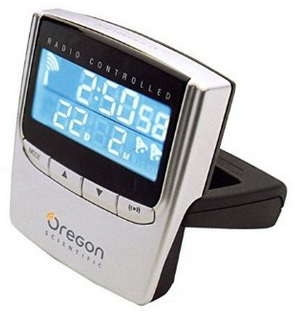 It is pretty danged expensive, but it comes with a nice radio. And it won’t blow away. Up to what speed in your case? In a CW activation the usual speed while dealing with a well disciplined pile up is between 1 and quite often 2 QSOs per minute. 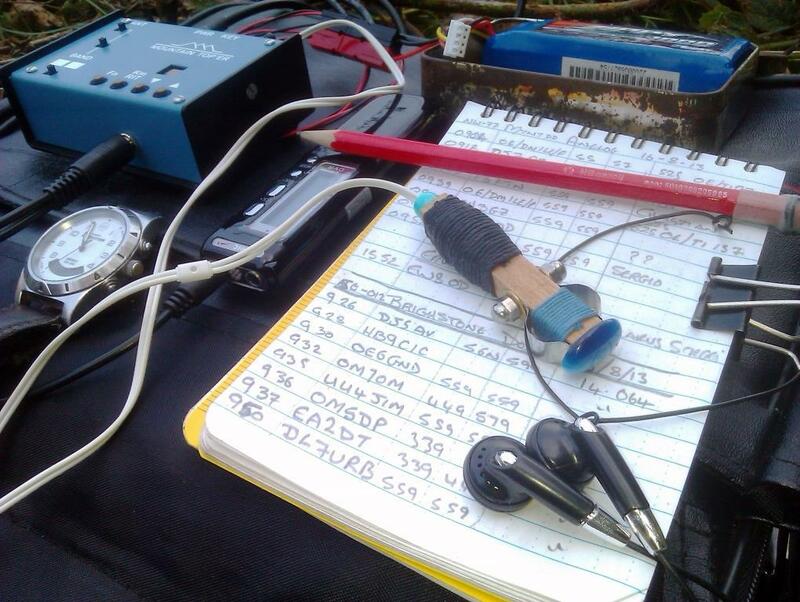 However, I remember some few times having logged 3 QSOs within the same minute. A different story is when in a contest or practising with the Morse runner program. 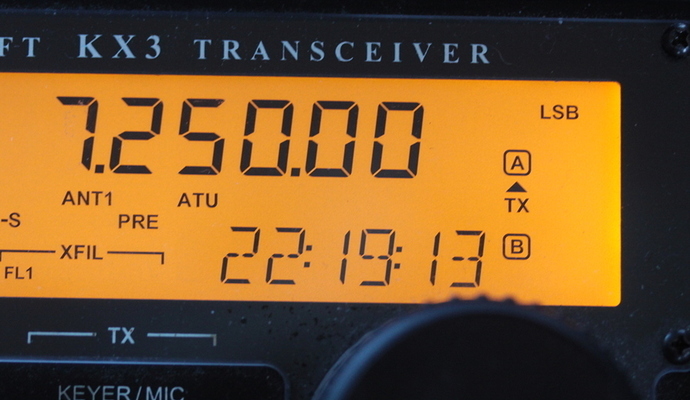 There I can log 4-5 QSOs per minute quite frequently. The main reason for this is that SOTA contacts are warmer, as we exchange 73’s, GL and say QSL or other nice things like the name of the operator, while there’s nothing of this in a contest QSO, just 599 TU and that’s it. I also find that I’m faster when typing callsings on a keyboard than hand writing them on a paper log in a summit. 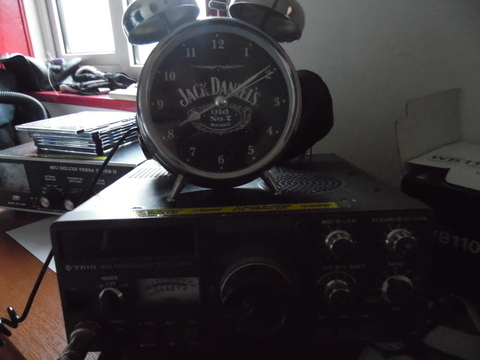 I got it many years ago and it used to receive a radio signal from some place in Frankfurt (I believe) in order to always get the exact time. 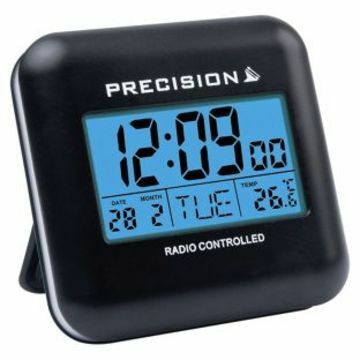 For some reason it stopped picking up that radio signal, which was indicated by those sort of radio waves coming out the top of a small vertical antenna represented on the top left side of the clock screen and mine only shows the vertical antenna now but no waves at all, so the time is not radio controlled any more. Do any of you have one of this type and are still getting that radio signal from Frankfurt? Wow, that’s really impressive, Victor. I have sometimes tried to send with my left hand and the feel (also the code sent) was so horrible that I immediately gave it up. I do work the paddle and write both with my right hand (despite having being born left handed) but I manage to hold the pen between my right hand fingers in a way that I find no problems to operate the paddle. I get 3-4 activations from a charged LiFe battery, so 3-4 hours of operating. Power drawn by the clock is negligible. I am surprised that I am the first with this reply - I use my GPS, because it is already with me, running continuously through every hike and SOTA activation. 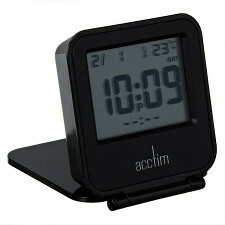 It has a screen called “Alarm Clock” that shows time. GPS time is incredibly accurate. 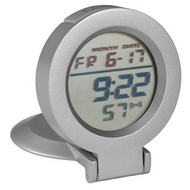 If you have a watch or clock you like to use, you can check it and set it with your GPS time. 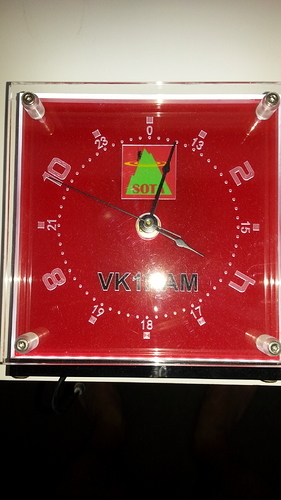 A homebrew SOTA clock in the shack, a gift from my daughter. It’s a one of a kind. Hello All, My watch is also Altimeter and dual time display; as you can see on photo, like Victor i’am right hander but do CW with left hand! 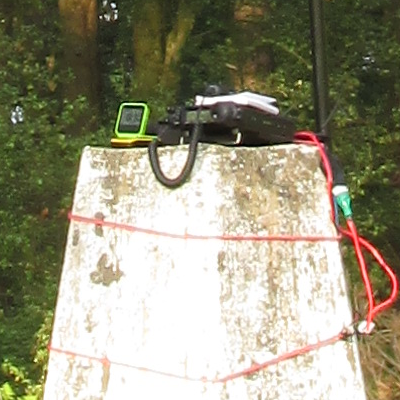 Here’s a photo of my SOTA watch… an old Timex Expedition, this was taken on Brightsone Down G/SE-012 on the Isle of Wight. Rig is a MTR-2 20/30m bands. Keyer is a ultra lightweight ‘Mini Blue Racer’ (my favorite paddles). which are kept in the Tobacco tin along with the 1800mAH LiFe battery. Hi Guru, yes, I have exactly that model at home, and it still receives the timing signal - though I think in my case the signal comes from Cumbria in the UK. The inverter has failed in mine, so no back light!